I think a lot of people thought it was so sort of shade structure for my plants. Well it is a shade structure but it isn’t for plants. It is for children! My back yard doesn’t have very much shade. Actually it has none. There are no big trees on my property or overhang from my neighbors. My daughter is loving being outside but I did want her to have a shady place she could retreat to if the sun was just too much. So I made this tent for her. It was the simplest design and very easy to make. 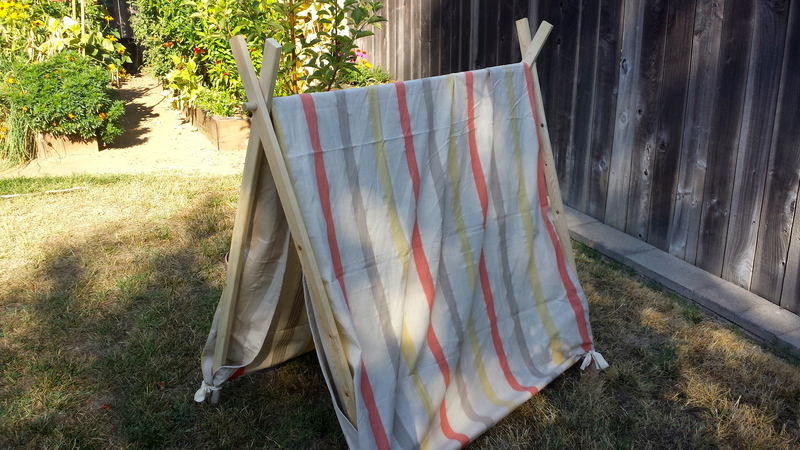 If you want to make your own check out the instructions for your very own DIY A-frame tent. 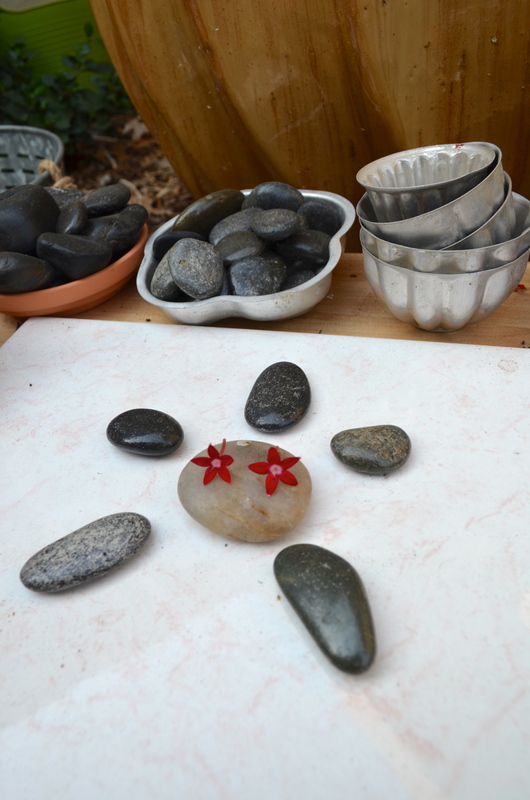 Actually this design is so simple that I might make a few more to fit over my garden beds to shade new seedlings! The frame collapses very easily because there are no nails or screws so it would work nicely in my garden since I don’t have a lot of storage space. 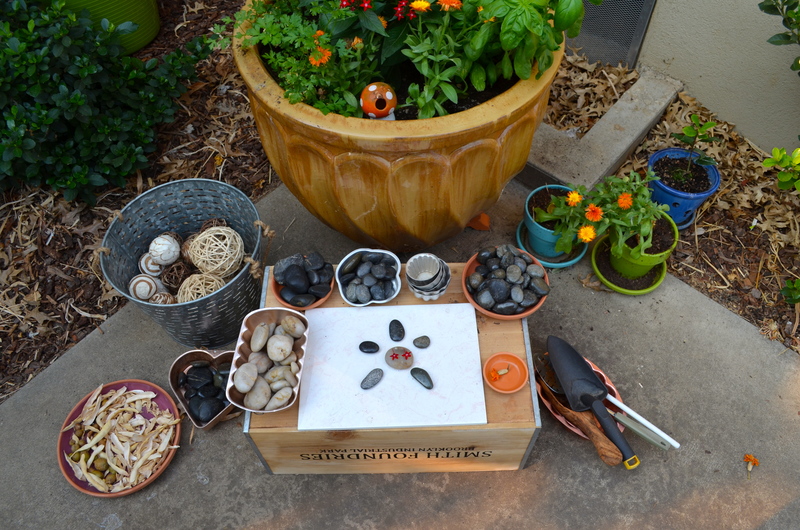 After observing my daughter in the garden, I have noticed that she loves picking up small things like the chive heads, flowers, rocks and especially the marbles in the bee bath. I am pretty lucky that my daughter doesn’t try to put too much in her mouth but I don’t want her to be playing with marbles just yet. Instead I set up her very own play space so she can freely play while I garden without me needing to hover over her. 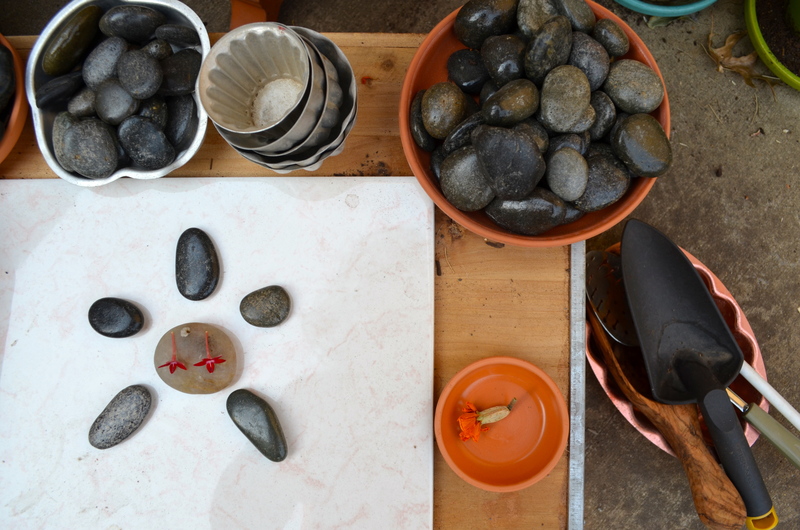 I reused the sand toys in the backyard space. 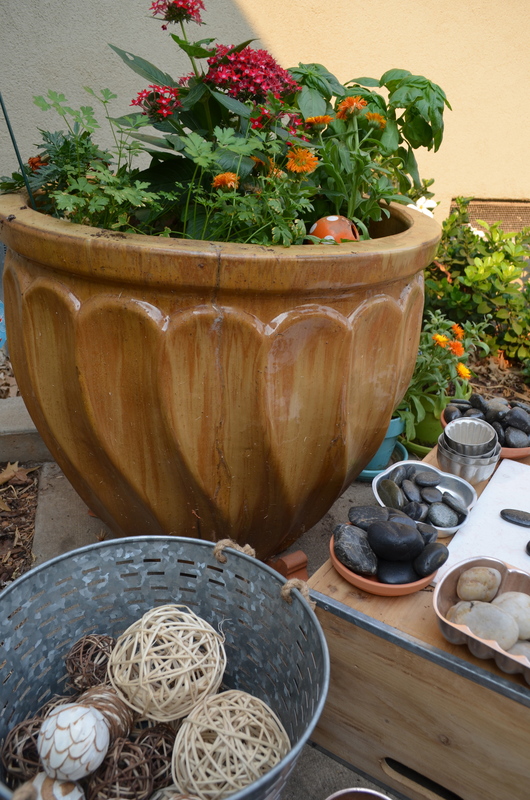 I added various rocks, decorative balls made from natural materials, dried bean shells, and dried flowers. I also planted some herbs and flowers around the area so she can freely pick. I want to move all these materials into a more permanent space by the tent, maybe a dirt or mulch pit for her to play in but the sprinklers would be a problem. I am still trying to figure the best placement for these spaces! 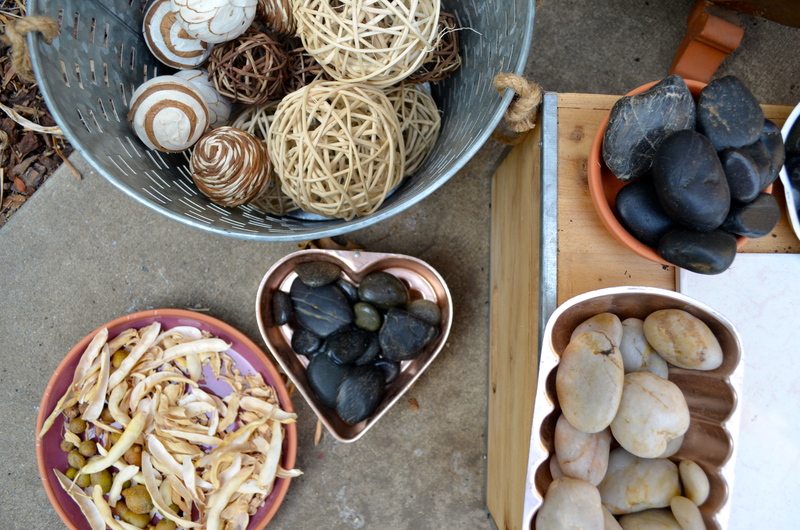 I am really inspired by this space so I hope to create something like this over time with my daughter so we can spend time together in the garden. 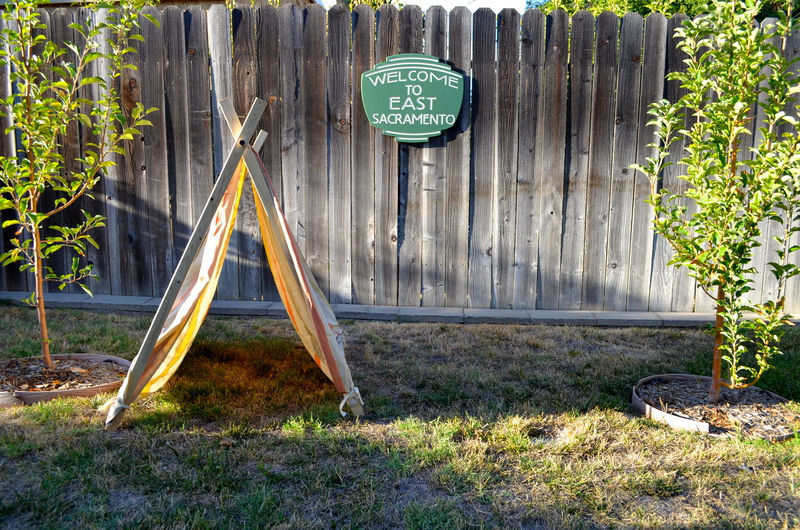 Tags: DIY A-frame tent, garden play space, gardening with children, natural materials | Permalink. Living the 'Good Life' the Brown way! We plant, we water, but only God can make it grow.